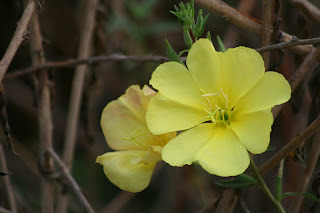 Yesterday I went down to the newly opened Nix Nature Center. 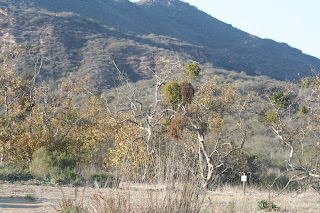 It is a part of the Laguna Coast Wilderness Park - a large parcel of land set aside, I think by Donald Bren's Irvine Company, to be left wild. I've only been there two times before, and on both occasions, I was there less than 20 minutes birding the parking lot, as both were Orange County big days. Unfortunately, with all my pre-Thanksgiving errands, I didn't make it there until 3pm only to find out they lock the gates at 4pm... darn. So I quickly peeked into the center to see what it was like, then stuck close to the parking lot and birded the sycamores. 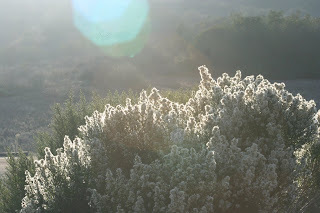 I had wanted to get back further in, since two of the research projects I'm interested in working on are conducted at the Laguna Coast Wilderness Park. As always, you can click on the photos to enlarge them for a better look. It was a monoculture of yellow-rumped warblers - and every one I saw was the Audubon's variety. 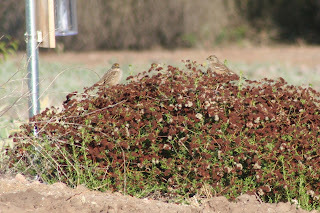 There were a few golden-crowned sparrows, and some white-crowned sparrows, juveniles and adults both, feeding in the buckwheat. There were lesser goldfinches saying their downward slurred "peeewww" and wrentits with their bouncing ball call. The area was a perfect example of why those wildfires a few weeks back raged out of control, it was bone dry. They did a good job on the native vegetation around the center, there was laural sumac, buckwheat, stream monkeyflower, coyote bush, encelia, and some others I recognized, but couldn't recall a name for. A red-tailed hawk circled over the parking lot, signaling my time to leave, it was nearly 4, and I don't think my family would appreciate me being locked in the parking lot all night since I'm the one cooking our dinner tonight! For the first time on my walk to my class this morning, I brought my binoculars. It was overcast and mild out. There were yellow-rumped warblers calling their drippy "chips" from the trees. Along the way I passed at least two different black phoebes fly-catching from light posts or tree limbs. The empty field across from my apartments had a huge flock of crows on the ground milling around and eating something, in among the California poppies. A house wren called from the bushes as I passed the business school. Since it worked nicely to bring my bins with me, I'm going to try and make semi-regular posts of the birding on campus during my class hours, and title them "Birding @ UCI". Well the Central Valley Birding Symposium this year was amazing as always. Without the disruption of a certain gull, the symposium lasted the full three days. I heard a number of very interesting speakers, enjoyed the lively I.D. panel, browsed the products laid out by vendors, engaged in some very interesting bird-related discussions, and as always, met some new people. 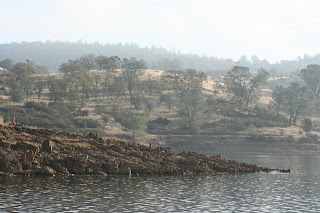 My friday field trip was the Pardee Reservoir Eagle Boat Trip. We were on water for about 4 hours and saw around 39 species (my list may not have been complete). 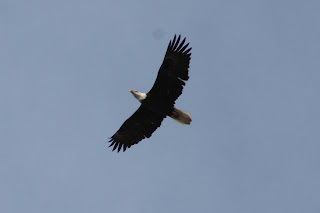 The highlights included both Bald and Golden Eagles, Rock and Canyon Wrens, and gorgeous looks at a Prarie Falcon. The weather was sunny and gorgeous, but a breeze over the water turned chilly in the latter half of the ride. My Saturday trip was to the Stockton Sewage Ponds, where a few years back we had a Harlequin Duck. 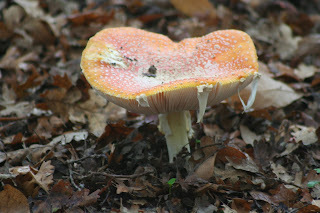 We had around 52 species by my count. There were large numbers of ducks like Northern Shovelers and Canvasbacks, and the highlights were a Ferruginous Hawk, a Merlin, and a female Redhead. Gigantic flocks of Cackling Geese going overhead were quite impressive as well. After lunch on Saturday the young birders as well as a few others went to Staten Island Rd. to get a little afternoon birding in. These flooded agricultural fields yielded few new species like Greater White-fronted Geese, Horned Larks and a Rough-legged Hawk. This was also a good spot to get a look at the Sandhill Cranes prevalent in the Central Valley. Sunday felt much more like the usual weather of the CVBS - with cold fog throughout the entire morning. I went to Cosumnes River Preserve, which was the local patch for one of my fellow young birders, Daryl. 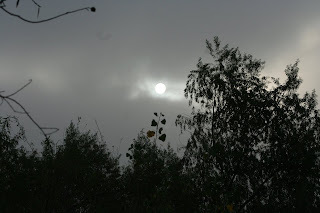 Because of the fog, it was wet and quiet. I only added one or two new species to my Sacramento county list. The highlights of the day included a beaver poking its head through water plants to the delight of the group. Birdwise, Golden-crowned Kinglets, Golden-crowned Sparrows, and Lincoln Sparrows were notably present. This tree had both a juvenile and an adult Bald Eagle perched in it! 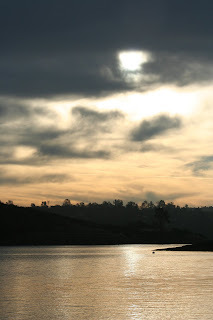 This is an example of the scenery at Pardee Reservoir. 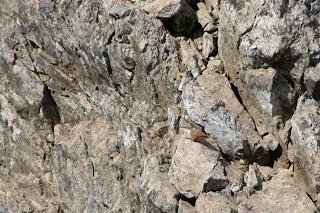 This lively Canyon Wren was a difficult bird to photograph. I got out of a class early today, and since it was just so gorgeously warm outside - 80+ degrees in November!?!! - I just had to take a stroll through Aldrich Park. Its a grassy, hilly area with a few nice sycamores and pines in the heart of the UC Irvine campus. I didn't have binoculars on me, but birds were calling, and feeding quite actively. There were winter migrants like the Ruby-crowned Kinglets and Yellow-rumped Warblers vocalizing loudly. At least two gorgeously marked Townsend's Warblers were foraging in the sycamores. A House Wren was calling loudly, and allowed me to get close enough that binoculars would have been virtually useless, before flying to safety. Song Sparrows and Black Phoebes were present as expected. As were the multiple Anna's Hummingbirds flying around large red flowers. A Downey Woodpecker gave me a bad case of "warbler neck" as I strained to see it near what seemed at the time like the top of the tallest tree in the park. Although it was a mere twenty minutes without the aid of even a pair of binoculars, I felt refreshed for having been able to sneak a little birding into what is otherwise a very busy school day! There is a new park being created over the 1,347 acres that used to be the El Toro Marine Corps Air Station here in Irvine, California. The Orange County Great Park, as it is being called, was not always the plan for the old base territory. The El Toro Airport was a hugely contraversial design, set to occupy the area that is now designated to become a great park... *whew* am I ever glad that it didn't pass. The park is set to include among other things: a 2.5 mile canyon, a 20+ acre lake, a 974 acre nature preserve, a Wildlife corridor linking the Cleveland National Forest to the Laguna Coast Wilderness Park, Botanical Gardens, a Great Lawn. The giant orange air balloon, which will take people over the park is already open and fully opperational. It offers free rides in 2007. This evening I attended a meeting of the Society for Conservation Biology, where guest speaker Scott Thomas gave a short slideshow on the raptors of Orange County. I also had the opportunity to hear about a couple of exciting research opportunities that I may decide to work on for the winter or spring quarters. They are pretty diverse: Scott's research with Red-tailed Hawks, a survey of the endanged plant species, the Laguna Beach Live-forever, and one involving using motion actived cameras to track the movements of large mammals at Laguna Coast Wilderness Park. 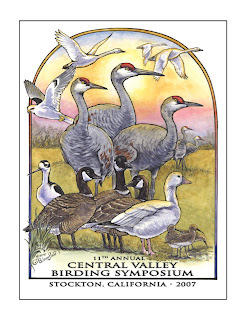 It's that time of year again, time for the Central Valley Birding Symposium. This has been one hectic year for me, what with transitioning to UC Irvine, and taking my first round of midterms and all, but I have a light at the end of the tunnel... the last of my midterms coincide with the weekend of the CVBS!! 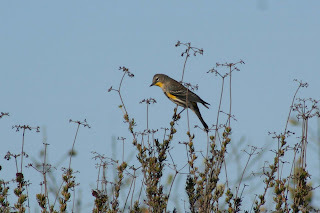 Three full days of birding in Stockton, California. I'm writing an essay in my environmental analysis and design course, and I found the subject so interesting, I thought I'd share. It's on the water crisis in the Upper and Lower Klamath Basin starting in 2000 (it compares the Klamath issue to a similar one in Montana). The area had been in a severe drought, and so the EPA decided to divert 33% of the water flow that normally goes to irrigation of crops on the many farms in the area, to the Klamath Lake and Tule Lake and surrounding rivers. This choice to divert water was prompted by the fact that the area supports an endangered species of fish - the shortnosed suckerfish. It is also a critical stop on the pacific flyway and supports large numbers of migrating birds, namely Bald Eages and is an important ground for American White Pelicans. The farmers were outraged that their crops were being threatened to protect a suckerfish, so they turned to illegal means to get their water. Opening floodwalls that were diverting the water to allow it to drain into their irrigation canals. The local police were not willing to do anything about these actions because they sided with the farmers. 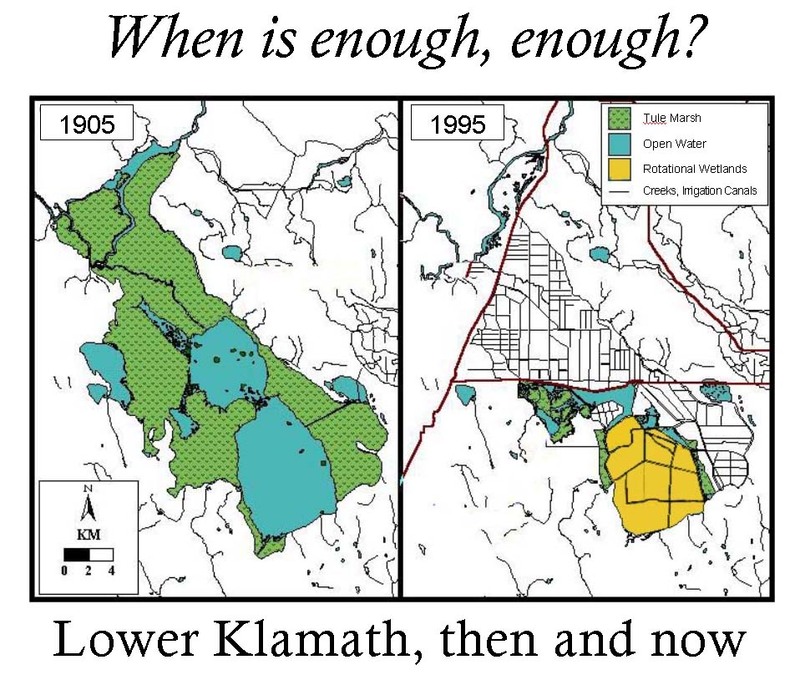 • The 2003 plan estimates–but does not guarantee–a 22,000 acre-feet water delivery to Lower Klamath and Tule Lake refuges. This represents the smallest water delivery to the refuges in 41 years. • U. S. Fish and Wildlife Service documents indicate 2002 was the sixth year out of the last 13 when the refuges received no water in the fall, when peak waterfowl migration occurs. The 2003 plan almost guarantees a seventh year of dry refuges. This chronic lack of water degrades marsh habitat, disrupts waterfowl migration, and reduces the food supply for threatened bald eagles. 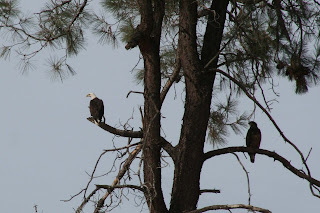 • The Upper Klamath Basin supports the largest seasonal concentration of bald eagles in the Lower 48 states, and Tule Lake and Lower Klamath refuges contain much of the key wintering habitat for these eagles (Keister et al., 1987). The 2003 plan supplies 10,000 acre-feet less water than required in 2001 to prevent a die-off of bald eagles. 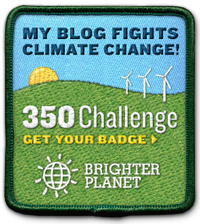 • The 2003 plan threatens California’s only remaining breeding colonies of American white pelicans, and two of the last fifteen colonies remaining in the world, located within Lower Klamath and Clear Lake refuges. Low water levels expose pelican nesting islands to predators, which can cause the mass desertion of nests and young. According to the California Department of Fish and Game, destruction of nesting islands and breeding habitat has caused a precipitous decline in pelican numbers. As of early April, three of Clear Lake’s four pelican nesting islands were already land-bridged by low water levels and unsuitable for nesting. • Combating avian botulism–a disease that can kill thousands of birds on the refuge in a single outbreak–requires the ability to alternatively flood or drain different parts of the refuge. Refuge water shortages insure the increased prevalence of botulism by preventing essential water management. • Development of Water Supply Production Wells for Lower Klamath NWR, Final EA, USFWS 2001, p. 26 refuge marshes will remain dry from August through November, leaving thousands of acres of critical refuge wetlands dry during the fall migration of waterfowl and other birds. Other marshes left dry by the plan include the Klamath Game Management areas at Squaw Point, Shoalwater Bay, and marsh restoration projects along the lake. • The plan’s low lake levels will increase the likelihood of algae blooms and related mass die-offs of endangered suckers in the late summer and early fall. Higher water levels can decrease the duration and intensity of such algae blooms (Laenen and LeTourneau 1996; Noges et al, 1997; Welch and Burke 2001; Sheffer 1998), thereby minimizing the likelihood of a recurrence of the devastating adult fish kills observed in 1995, 1996, and 1997. • Lowered lake levels will cut off suckers from essential spawning habitat around the lake. Loss of spawning grounds is one of the principle factors in the decline of the lake’s sucker populations. Lowered levels will also cut off access to the cool, clear waters of lakeside springs and creeks, where fish often take refuge from the lake’s often lethal water quality conditions. • The lake’s wetland areas provide critical safe havens for young Lost River and shortnosed suckers, which use marshes to escape predators. The dramatic, long-term loss of marsh habitat under the Bureau’s plan will greatly reduce their chances for survival, and impact sucker populations for generations to come. • The plan’s long-term low lake levels will worsen Upper Klamath Lake’s already extreme water quality problems. Leaving the marshes dry from August through November will eliminate the positive water-filtering function of the lake’s bordering wetlands. In addition, chronically dry marshes may become a source of poor water quality: exposed marsh peat soils can oxidize, releasing nitrogen and phosphorous. When water finally returns to the marshes, these pollutants wash into the lake and increase water quality problems. I took my boyfriend Drew out birding with me this morning at SJWS. 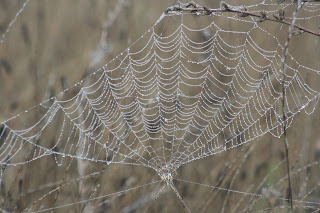 It was a cool, foggy morning that felt just right for November. We found plenty of ducks on the ponds - northern pintails, northern shovelers, ruddy ducks, American widgeons, gadwalls, green-wing teal and cinnamon teal. We walked around the first few ponds, then headed across the boardwalk into the back area where I have been wandering more and more recently. There was a hermit thrush calling, and spotted a fox sparrow, one of my favorites, scraping alongside the trail. We heard a Nuttall's woodpecker calling, and when I looked up to point it out to Drew, in the same tree was a northern flicker. Although he is not officially a birder, he was impressed by the pied-billed grebe in the small creek that had caught a fish and was struggling to swallow it. This Yariguíes Brush-Finch was news itself when it was discovered in Colombia, South America. It was described in the Bulletin of the British Ornithologists Club (Vol. 126: June 2006).